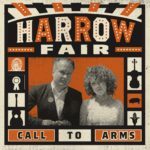 Harrow Fair comprises Miranda Mulholland (vocals, violin and percussion) and Andrew Penner (vocals, guitars, drums, piano, bass, organs, synths, vibes, glockenspiel, banjo and percussion); just another Americana duo? I don’t think so. Just one look at the instrumental credits will tell you that. Miranda and Andrew have all the traditional skills for the duo line-up; they play a variety of stringed and percussion instruments, sing beautifully and build great harmonies, but they’re not content to stop at that. “Call to Arms” is experimental Americana. The opening song, “Hangnail”, gives you a few clues to the direction that they’re taking with its overdriven guitar, fiddle refrain and thudding percussion taking a decidedly lo-fi direction. As the album progresses there are more unexpected instrument sounds; there are a few songs with some evil distortion on the fiddle sound and “How Cold” has the feel of a Gaelic dirge with a constant drone, but with overlaid synths and some thunderous bass. The disparate elements gel to create a satisfying song. The preceding song, “Harrow Fair Pig Auction” isn’t quite so successful, featuring a recording of two auctioneers overlaid with freeform improvisation, but that’s experimentation for you. Definitely worth a listen for the bending and warping of musical forms. “Call to Arms” is released on May 19th on Roaring Girl Records.